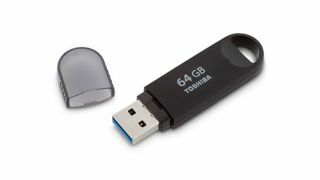 Toshiba has launched a new high-capacity and high-speed USB 3.0 flash drive that lets you create public and private partitions to keep prying eyes and hands away from your secret files. The TransMemory Pro also comes with built-in security software and encrypted password protection. Available in 64GB or 128GB sizes, it matches the recently unveiled 128GB memory card by SanDisk for capacity. The storage device not only touts large capacities, but offers high data transfer speeds too. Read speeds of up to 222MB/s are possible, with write speeds coming in at up to 205MB/s. The drive is compatible with PCs or Apple Mac computers. It's plug-and-play, meaning no driver or software setup is required. These enhancements make it a viable portable storage device for business use, with Toshiba citing executives, sales professionals, photographers and advanced users as its target audience. The drive features a durable frame and also comes with a five year standard limited warranty. The 64GB model retails for $129.99 (£78, AU$145), while the 128GB model goes for $199.99 (£120, AU$222). Both are available now.